The Fellowship was fortunate enough to obtain a copy of POWER CUBED #1 from Dark Horse Comics. Aaron Lopresti writes and draws, and Hi-Fi Design colors. Kenny and his dad haven’t been able to communicate since Kenny’s mom died, in an awkward silence kind of way. Dad is a scientist, and Kenny is very artistic and imaginative. On Kenny’s 18th birthday, Dad gives Kenny the thing he’s been working on – a small cube with the ability to transmute objects. But a deranged Nazi scientist and his bumbling lackeys want the cube, and Kenny is forced to run away. The premise is simple – keep the cube away from the bad guy. But this story is much more complicated and interesting than that. Kenny’s a good kid in a bad position (on several levels), and he’s on the run, which will keep him from having time to think. And those are great points on which to build a fast-paced adventure story. And the art is amazingly detailed; the cube itself and the bad guy’s house are both beautifully drawn, and that’s just the beginning. The cool variable in this story is the cube and what Kenny can do with it. Imagination is the limit, both with the cube and with this book. You’ll want to check it out. 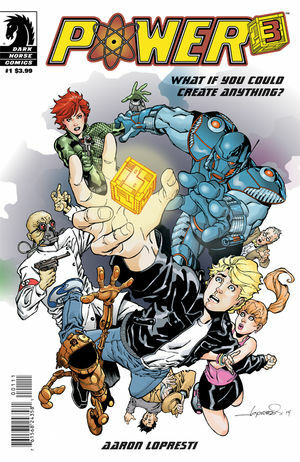 POWER CUBED #1 is available now at your FLCS or at darkhorse.com.